Date of birth unknown; died 816. He was elected on the very day his predecessor was buried (26 Dec., 795), and consecrated on the following day. It is quite possible that this haste may have been due to a desire on the part of the Romans to anticipate any interference of the Franks with their freedom of election. Leo was a Roman, the son of Atyuppius and Elizabeth. At the time of his election he was Cardinal-Priest of St. Susanna, and seemingly also vestiarius, or chief of the pontifical treasury, or wardrobe. 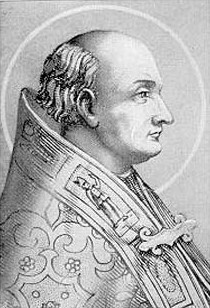 Prompted by jealousy or ambition, or by feelings of hatred and revenge, a number of the relatives of Pope Adrian I formed a plot to render Leo unfit to hold his sacred office. 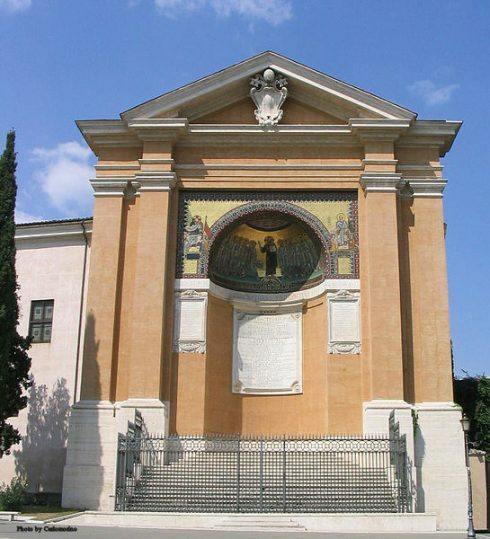 On the occasion of the procession of the Greater Litanies (25 April, 799), when the pope was making his way towards the Flaminian Gate, he was suddenly attacked by a body of armed men. He was dashed to the ground, and an effort was made to root out his tongue and tear out his eyes. After he had been left for a time bleeding in the street, he was hurried off at night to the monastery of St. Erasmus on the Cœlian. There, in what seemed quite a miraculous manner, he recovered the full use of his eyes and tongue. Escaping from the monastery, he betook himself to Charlemagne, accompanied by many of the Romans. He was received by the Frankish king with the greatest honour at Paderborn, although his enemies had filled the king’s ears with malicious accusations against him. After a few months’ stay in Germany, the Frankish monarch caused him to be escorted back to Rome, where he was received with every demonstration of joy by the whole populace, natives and foreigners. The pope’s enemies were then tried by Charlemagne’s envoys and, being unable to establish either Leo’s guilt or their own innocence, were sent as prisoners to France (Frankland). In the following year (800) Charlemagne himself came to Rome, and the pope and his accusers were brought face to face. The assembled bishops declared that they had no right to judge the pope; but Leo of his own free will, in order, as he said, to dissipate any suspicions in men’s minds, declared on oath that he was wholly guiltless of the charges which had been brought against him. At his special request the death sentence which had been passed upon his principal enemies was commuted into a sentence of exile. A few days later, Leo and Charlemagne again met. It was on Christmas Day in St. Peter’s. After the Gospel had been sung, the pope approached Charlemagne, who was kneeling before the Confession of St. Peter, and placed a crown upon his head. The assembled multitude at once made the basilica ring with the shout: “To Charles, the most pious Augustus, crowned by God, to our great and pacific emperor life and victory!” By this act was revived the Empire in the West, and, in theory, at least, the world was declared by the Church subject to one temporal head, as Christ had made it subject to one spiritual head. It was understood that the first duty of the new emperor was to be the protector of the Roman Church and of Christendom against the heathen. With a view to combining the East and West under the effective rule of Charlemagne, Leo strove to further the project of a marriage between him and the Eastern empress Irene. Her deposition, however (801), prevented the realization of this excellent plan. Some three years after the departure of Charlemagne from Rome (801), Leo again crossed the Alps to see him (804). According to some he went to discuss with the emperor the division of his territories between his sons. At any rate, two years later, he was invited to give his assent to the emperor’s provisions for the said partition. Equally while acting in harmony with the pope, Charlemagne combatted the heresy of Adoptionism which had arisen in Spain; but he went somewhat further than his spiritual guide when he wished to bring about the general insertion of the Filioque in the Nicene Creed. The two were, however, acting together when Salzburg was made the metropolitical city for Bavaria, and when Fortunatus of Grado was compensated for the loss of his see of Grado by the gift of that of Pola. The joint action of the pope and the emperor was felt even in England. Through it Eardulf of Northumbria recovered his kingdom, and the dispute between Eanbald, Archbishop of York, and Wulfred, Archbishop of Canterbury, was regulated. Leo had, however, many relations with England solely on his own account. By his command the synod of Beccanceld (or Clovesho, 803), condemned the appointing of laymen as superiors of monasteries. In accordance with the wishes of Ethelheard, Archbishop of Canterbury, Leo excommunicated Eadbert Praen for seizing the throne of Kent, and withdrew the pallium which had been granted to Litchfield, authorizing the restoration of the ecclesiastical jurisdiction of the See of Canterbury “just as St. Gregory the Apostle and Master of the nation of the English had arranged it”. Leo was also called upon to intervene in the quarrels between Archbishop Wulfred and Cenulf, King of Mercia. Very little is known of the real causes of the misunderstandings between them, but, whoever was the more to blame, the archbishop seems to have had the more to suffer. The king appears to have induced the pope to suspend him from the exercise of his episcopal functions, and to keep the kingdom under a kind of interdict for a period of six years. Till the hour of his death (822), greed of gold caused Cenulf to continue his persecution of the archbishop. It also caused him to persecute the monastery of Abingdon, and it was not until he had received from its abbot a large sum of money that, acting, as he declared, at the request of “the lord Apostolic and most glorious Pope Leo”, he decreed the inviolability of the monastery. 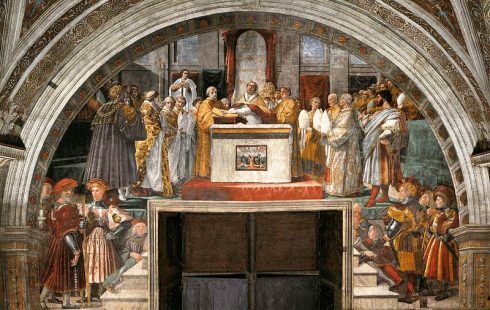 The Oath of Pope St. Leo III, painting by Raphael. Not only in the last mentioned transaction, but in all matters of importance, did the pope and the Frankish emperor act in concert. It was on Charlemagne’s advice that, to ward off the savage raids of the Saracens, Leo maintained a fleet, and caused his coast line to be regularly patrolled by his ships of war. But because he did not feel competent to keep the Moslem pirates out of Corsica, he entrusted the guarding of it to the emperor. Supported by Charlemagne, he was able to recover some of the patrimonies of the Roman Church in the neighbourhood of Gaeta, and again to administer them through his rectors. But when the great emperor died (28 Jan., 814), evil times once more broke on Leo. Af fresh conspiracy was formed against him, but on this occasion the pope was apprised of it before it came to a head. He caused the chief conspirators to be seized and executed. No sooner had this plot been crushed than a number of nobles of the Campagna rose in arms and plundered the country. They were preparing to march on Rome itself, when they were overpowered by the Duke of Spoleto, acting under the orders of the King of Italy (Langobardia). The large sums of money which Charlemagne gave to the papal treasury enabled Leo to become an efficient helper of the poor and a patron of art, and to renovate the churches, not only of Rome, but even of Ravenna. He employed the imperishable art of mosaic not merely to portray the political relationship between Charlemagne and himself, but chiefly to decorate the churches, especially his titular church of St. Susanna. Up to the end of the sixteenth century a figure of Leo in mosaic was to be seen in that ancient church. Leo III was buried in St. Peter’s (12 June, 816), where his relics are to be found along with those of Sts. Leo I, Leo II, and Leo IV. He was canonized in 1673. The silver denarii of Leo III still extant bear the name of the Frankish emperor upon them as well as that of Leo, showing thereby the emperor as the protector of the Church, and overlord of the city of Rome. Liber Pontificalis, ed. DUCHESNE, II (Paris, 1892), 1 sqq. ; Codex Carolinus, ed. JAFFÉ (Berlin, 1867); Annales Einhardi (so called) and other Chronicles, in Mon. Germ. : Script., I; Carmen de Carolo Magno, in P.L., XCVIII. Cf. BRYCE, The Holy Roman Empire (London, 1889A); KLEINKLAUSZ, L’Empire Carolingien (Paris, 1902); HODGKIN, Italy and her Invaders, VIII (Oxford, 1899); BÖHMER, Regesta Imperii, ed. MÜHLBACHER, I (Innsbruck, 1908); MANN, The Lives of the Popes in the Early Middle Ages, II (London, 1906), 1 sqq. 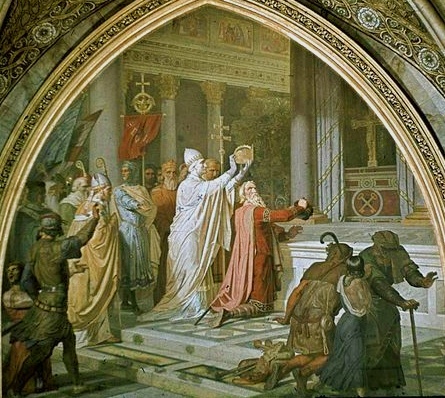 Pope St. Leo III’s crowning of Charlemagne on Christmas Day, 800 A.D. is one of History’s finest moments. There is no doubt the great Charles deserved the crown. His wars and conquests, the extent of his domains, his governing ability and promotion of learning, all underscored how worthy he was of receiving the title of Emperor of the West. Moreover, he had protected the Church and the Papacy and defended Christendom against the Muslims invading from the South and pagans from the North and East. It is particularly beautiful that it was the Vicar of Christ who determined that Charles deserved the crown, and then bestowed it upon him. 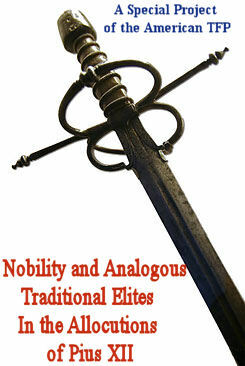 This gave an unsurpassable sublimity and nobility to the coronation act. That the coronation was done in Rome, in St. Peter’s basilica, and on Christmas Day, all add to the sublime majesty of the event. The facts are not in dispute: after centuries of abandonment, the Empire of the West was restored by the Papacy.